We compute and as before. After we write down the integrals, we change variables from back to , noting also that . The two most common half periods that show up in examples are and 1 because of the simplicity of the formulas. We should stress that we have done no new mathematics, we have only changed variables. If you understand the Fourier series for -periodic functions, you understand it for -periodic functions. You can think of it as just using diï¬€erent units for time. All that we are doing is moving some constants around, but all the mathematics is the same. extended periodically. The plot of the periodic extension is given in Figure 4.8. Compute the Fourier series of . Figure 4.8: Periodic extension of the function . Let us explicitly write down the ï¬�rst few terms of the series up to the harmonic. The plot of these few terms and also a plot up to the harmonic is given in Figure 4.9. You should notice how close the graph is to the real function. You should also notice that there is no â€œGibbs phenomenonâ€� present as there are no discontinuities. Figure 4.9: Fourier series of up to the harmonic (left graph) and up to the harmonic (right graph). Let be a function deï¬�ned on an interval . Suppose that we ï¬�nd ï¬�nitely many points , , , â€¦, in the interval, such that is continuous on the intervals , , â€¦, . Also suppose that all the one sided limits exist, that is, all of , , , , , â€¦, exist and are ï¬�nite. Then we say is piecewise continuous. If moreover, is diï¬€erentiable at all but ï¬�nitely many points, and is piecewise continuous, then is said to be piecewise smooth. 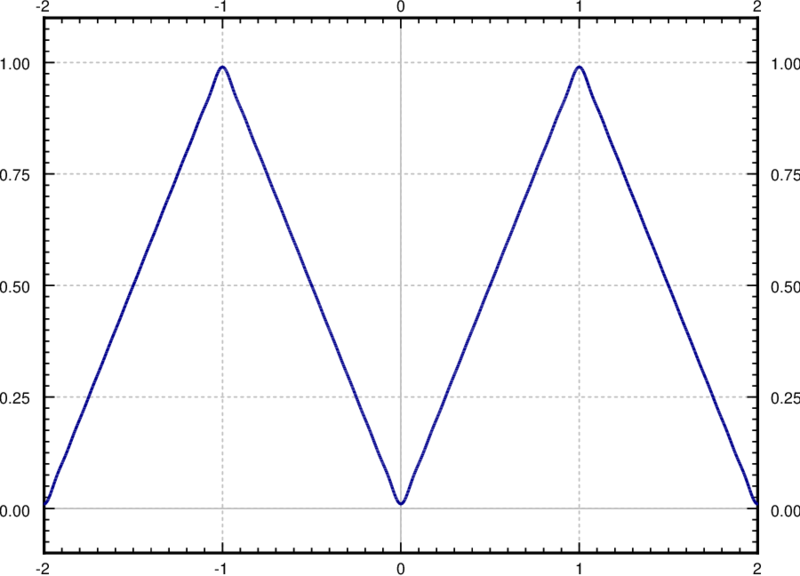 Example 4.3.2: The square wave function (4.8) is piecewise smooth on or any other interval. In such a case we simply say that the function is piecewise smooth. Example 4.3.3: The function is piecewise smooth. Example 4.3.4: The function is not piecewise smooth on (or any other interval containing zero). In fact, it is not even piecewise continuous. Example 4.3.5: The function is not piecewise smooth on (or any other interval containing zero). is continuous, but the derivative of is unbounded near zero and hence not piecewise continuous. Piecewise smooth functions have an easy answer on the convergence of the Fourier series. If we happen to have that at all the discontinuities, the Fourier series converges to everywhere. We can always just redeï¬�ne by changing the value at each discontinuity appropriately. Then we can write an equals sign between and the series without any worry. We mentioned this fact brieï¬‚y at the end last section. Note that the theorem does not say how fast the series converges. Think back to the discussion of the Gibbs phenomenon in the last section. The closer you get to the discontinuity, the more terms you need to take to get an accurate approximation to the function. Not only does Fourier series converge nicely, but it is easy to diï¬€erentiate and integrate the series. We can do this just by diï¬€erentiating or integrating term by term. It is important that the function is continuous. It can have corners, but no jumps. Otherwise the diï¬€erentiated series will fail to converge. For an exercise, take the series obtained for the square wave and try to diï¬€erentiate the series. Similarly, we can also integrate a Fourier series. where and is an arbitrary constant. Note that the series for is no longer a Fourier series as it contains the term. The antiderivative of a periodic function need no longer be periodic and so we should not expect a Fourier series. Let us do an example of a periodic function with one derivative everywhere. and extend to a 2-periodic function. The plot is given in Figure 4.10. Figure 4.10: Smooth 2-periodic function. This function has one derivative everywhere, but it does not have a second derivative whenever is an integer. Exercise 4.3.1: Compute and . Let us compute the Fourier series coeï¬ƒcients. The actual computation involves several integration by parts and is left to student. it is almost indistinguishable from the plot of in Figure 4.10. In fact, the coeï¬ƒcient is already just 0.0096 (approximately). The reason for this behavior is the term in the denominator. The coeï¬ƒcients in this case go to zero as fast as goes to zero. For functions constructed piecewise from polynomials as above, it is generally true that if you have one derivative, the Fourier coeï¬ƒcients will go to zero approximately like . If you have only a continuous function, then the Fourier coeï¬ƒcients will go to zero as . If you have discontinuities, then the Fourier coeï¬ƒcients will go to zero approximately as . For more general functions the story is somewhat more complicated but the same idea holds, the more derivatives you have, the faster the coeï¬ƒcients go to zero. Similar reasoning works in reverse. If the coeï¬ƒcients go to zero like you always obtain a continuous function. If they go to zero like you obtain an everywhere diï¬€erentiable function. Exercise 4.3.2: Use a computer to plot the series we obtained for , and . 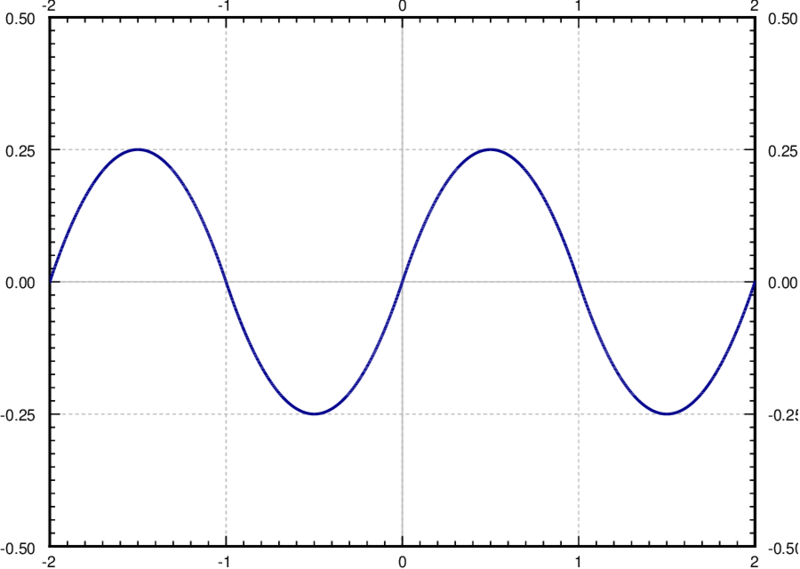 That is, plot say the ï¬�rst 5 harmonics of the functions. At what points does have the discontinuities? extended periodically. a) Compute the Fourier series for . b) Write out the series explicitly up to the harmonic. extended periodically (period is 20). a) Compute the Fourier series for . b) Write out the series explicitly up to the harmonic. Exercise 4.3.6: Let . Is continuous and diï¬€erentiable everywhere? Find the derivative (if it exists everywhere) or justify why is not diï¬€erentiable everywhere. Exercise 4.3.7: Let . Is diï¬€erentiable everywhere? Find the derivative (if it exists everywhere) or justify why is not diï¬€erentiable everywhere. extended periodically. a) Compute the Fourier series for . b) Write out the series explicitly up to the harmonic. c) What does the series converge to at . extended periodically. a) Compute the Fourier series for . b) By plugging in , evaluate . c) Now evaluate . extended periodically. a) Compute the Fourier series for . b) Write out the series explicitly up to the 3rd harmonic. a) Find the antiderivative. b) Is the antiderivative periodic? extended periodically. a) Compute the Fourier series for . b) Plug in to ï¬�nd a series representation for . c) Using the ï¬�rst 4 terms of the result from part b) approximate .